If you haven’t done some pruning, this time of the year is a good time to take some parts of your trees or shrubs. A little off the top won’t hurt. By mid-July to early August, your trees or shrubs may be looking a bit disorganized, so now is the best time to take those cutters and shave off overgrown shrubs and branches. Removing at least one-third of the oldest branches can help reduce the strain experienced by your plants, thus giving way to more healthy branches. If you’re growing plants like plum, peaches, or apples, pruning ground-level growth can help your plants bear more fruits in the coming months. Flowering plants will also benefit from pruning if you cut out weak sprouts that grow vertically from the branches. But of course – do not over-prune your plants. You don’t want your plants to look “bald” and defenseless from the harsh elements. Spider Mites – Mites are extremely active during summer, and it’s very hard to know that your plant is infested because of the size of these pests. An indicator that your plant may be infested is the discoloration on the leaves of your plant – a result of mites feeding on them. Spraying your plants with an eco-friendly pesticide can help limit their feeding activities as well as reproduction. Japanese Beetles – Almost everyone who spent time in a garden has encountered this pest. It’s about 3/8 inches in length and usually has a metallic green or copper color. It feeds on leaves and stems of various plants, damaging foliage greatly due to their numbers. July is the month when most of these beetles reach maturity, and they live for another 30 to 50 days. If they are already causing much damage, then perhaps it’s time for a good spraying. Cinch Bugs – These are most often found in lawns as opposed to trees and shrubs. A discolored (usually patches of yellow or brown) and bare lawn may be an indicator of infestation. July is a busy month for these pests. Luckily, a simple solution of soapy water usually does the trick. It’s also wise to consult your landscaper to check if it’s time to coordinate with a trusted pest control company. Don’t start spraying unless you already know what you’re dealing with. Remember, these three are not the only bugs that can ruin your plants. Heed the help of experts if you’re unsure. Call the Experts – There are many things that can happen during this time of the year, and your plants must be prepared well for the coming fall. 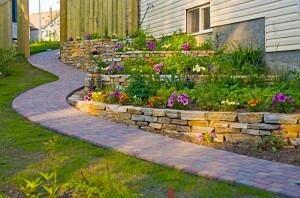 Calling your trusted landscaping company can greatly help in making your garden look and feel its best.